Dark golden ale with good strength and a fresh hop taste. Hambleton Bard dry beer kits are lightweight and ideal for taking aboard. The perfect English Bitter, balanced hop aroma and with a good body. Hambleton Bard dry beer kits are lightweight and ideal for taking aboard. Pale golden in colour, fresh hoppy taste, a very well balanced English Lager. Hambleton Bard dry beer kits are lightweight and ideal for taking aboard. Full bodied, medium dark stunning quality Ale with a distinct hoppiness. 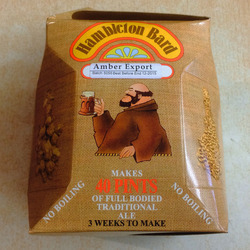 Hambleton Bard dry beer kits are lightweight and ideal for taking aboard.